By Mike Ryan, July 28, 2008 in Plugins - Publishing ONLY! 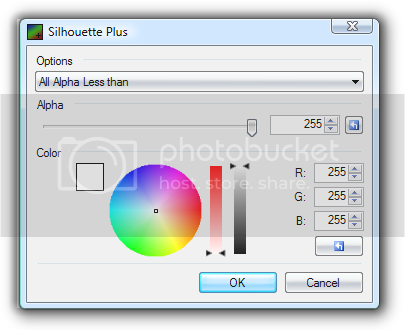 Silhouette converts the entire canvas into your selected color while preserving the alpha levels of each pixel. As well, you can also specify an alpha range in which to silhouette. This is usefull for object manipulation and for testing the transparency of the canvas is particular areas. To install this plugin, either copy and paste the included DLL into your Paint.NET Effects folder. From there, the plugin should then be included in your Object submenu. If not, please post in the Plugin Troubleshooting thread found in the Plugins - Publishing Only forum. Please note that this plugin is incompatible with Simon Brown's Right Click Install application. Is there a chance you could simply put the DLL in a different archive with no folder? Not only for the right-click installer but also due to the fact that before RCI I unzipped the archive directly to C:\Program Files\Paint.NET\Effects and there may be other members doing the same. I have looked through the readme file and most of what it contained I could gather from reading the first post, and I don't see why users who don't bother reading the first post will bother with a readme file. Most of the contents of the file I realised even before reading the thread, so could you point me to the part that it is essential for users to read. Maybe the license agreement? Perhaps knowing that there is an offline resource? I say let it be. Um... Why is your sig an ad for Photobucket? Unfortuntly the images in this thread have the same problem. Cut out the image first. Alright, guys. I just upgraded my Photobucket account to 'Pro' so all of the images that I may have posted anywhere are all there. Your on the wrong forum buddy. This is for PDN and if you were in the right forums you would be posting in the wrong place.Sorry. I am spammer and I am looking for any reference on wall spamming. I would like to spam a large wall painting of my school. It needs to be pretty simple, but with lots of color and a great theme. I want some help for this spam. I have already tried in some places for the reference but haven’t got. Do you have any experience of a wall spamming so that I can overcome form my spamming work. ive tried this and the other plugin "silhouette" and have gotten no such result as the one below-which should be what the plugin is for,right? I am assuming that you are trying to change the color of the black silhouette? In order to do this, use the Magic Wand tool ( ) to select the black portion of the image. Then hit CTRL+X. From there, add a new layer and press CTRL+V. Now run my Silhouette plugin and you should be good to go.